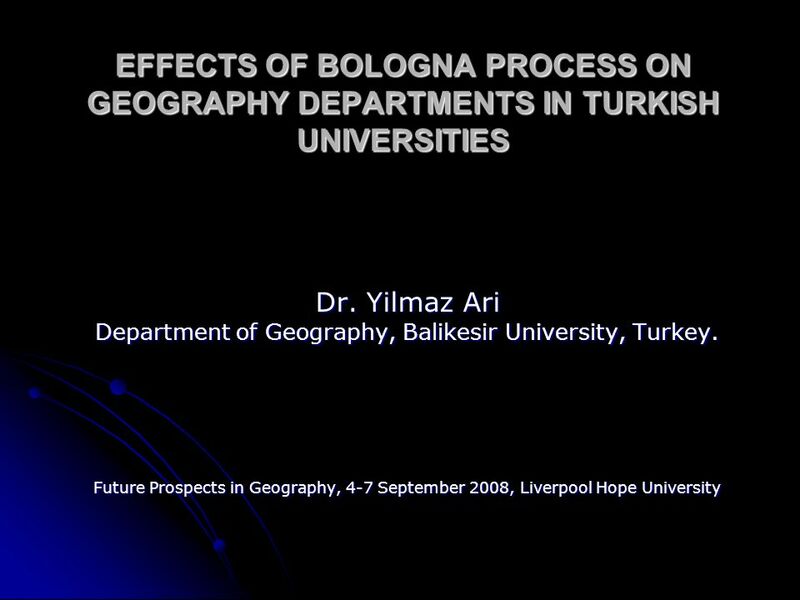 EFFECTS OF BOLOGNA PROCESS ON GEOGRAPHY DEPARTMENTS IN TURKISH UNIVERSITIES Dr. Yilmaz Ari Department of Geography, Balikesir University, Turkey. Future. 4 Action lines defined in the Bologna Declaration 1. Adoption of a system of easily readable and comparable degrees 1. Adoption of a system of easily readable and comparable degrees 2. Adoption of a system essentially based on two main cycles 2. Adoption of a system essentially based on two main cycles 3.  Establishment of a system of credits 3. Establishment of a system of credits 4. Promotion of mobility for students and academic and administrative staff 4. Promotion of mobility for students and academic and administrative staff 5. Promotion of European cooperation in quality assurance 5. Promotion of European cooperation in quality assurance 6. Promotion of the European dimension in higher education 6. 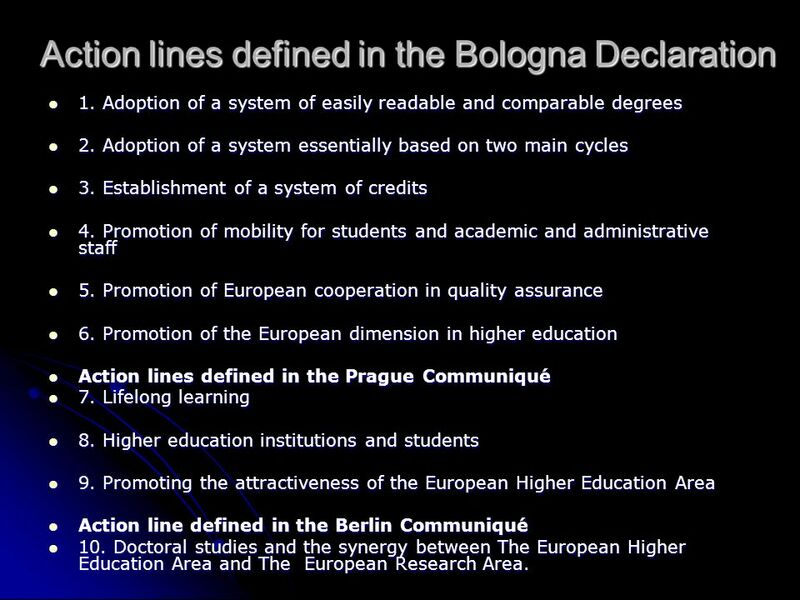 Promotion of the European dimension in higher education Action lines defined in the Prague Communiqué Action lines defined in the Prague Communiqué 7. Lifelong learning 7. Lifelong learning 8. Higher education institutions and students 8. Higher education institutions and students 9. Promoting the attractiveness of the European Higher Education Area 9. Promoting the attractiveness of the European Higher Education Area Action line defined in the Berlin Communiqué Action line defined in the Berlin Communiqué 10. Doctoral studies and the synergy between The European Higher Education Area and The European Research Area. 10. Doctoral studies and the synergy between The European Higher Education Area and The European Research Area. 5 The Bologna Process in Turkey The YOK (Higher Education Board) has undertaken the implementation of the Bologna process in Turkey. Since the beginning two national reports have been published by the YOK. The YOK (Higher Education Board) has undertaken the implementation of the Bologna process in Turkey. Since the beginning two national reports have been published by the YOK. 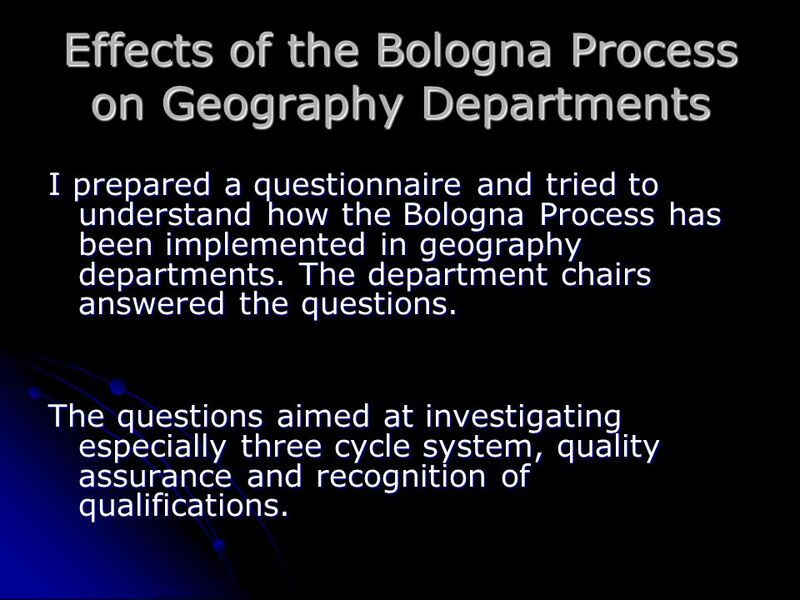 8 Effects of the Bologna Process on Geography Departments I prepared a questionnaire and tried to understand how the Bologna Process has been implemented in geography departments. The department chairs answered the questions. The questions aimed at investigating especially three cycle system, quality assurance and recognition of qualifications. 9 Findings All geography departments adopted the two/three cycle system (undergraduate/masters/doctoral) in Turkey All geography departments adopted the two/three cycle system (undergraduate/masters/doctoral) in Turkey Almost all departments made progress in terms of creating comparable degree programs and recognition of ECTS. Almost all departments made progress in terms of creating comparable degree programs and recognition of ECTS. 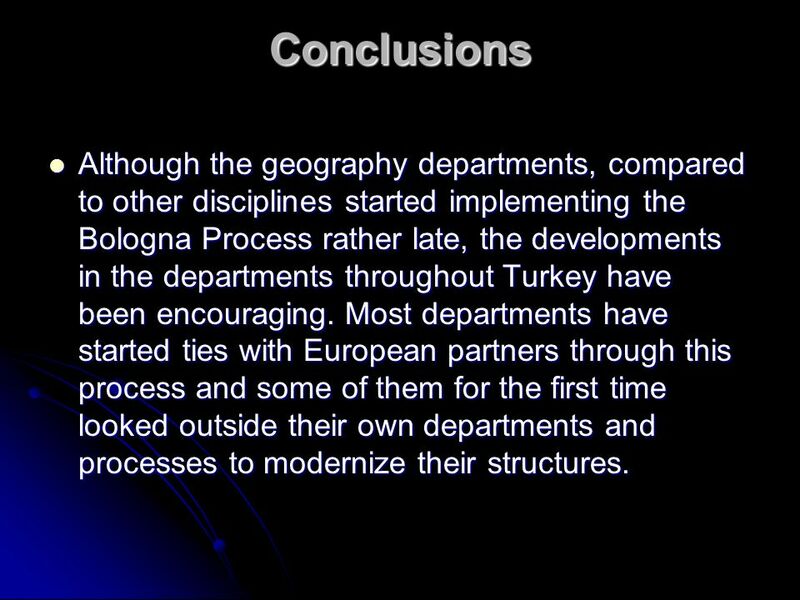 11 Conclusions Although the geography departments, compared to other disciplines started implementing the Bologna Process rather late, the developments in the departments throughout Turkey have been encouraging. Most departments have started ties with European partners through this process and some of them for the first time looked outside their own departments and processes to modernize their structures. Although the geography departments, compared to other disciplines started implementing the Bologna Process rather late, the developments in the departments throughout Turkey have been encouraging. Most departments have started ties with European partners through this process and some of them for the first time looked outside their own departments and processes to modernize their structures. 12 Conclusions Compared to other disciplines a number of publications stressed that academic geography in Turkey rather weak and there is a strong need to modernize the departments. 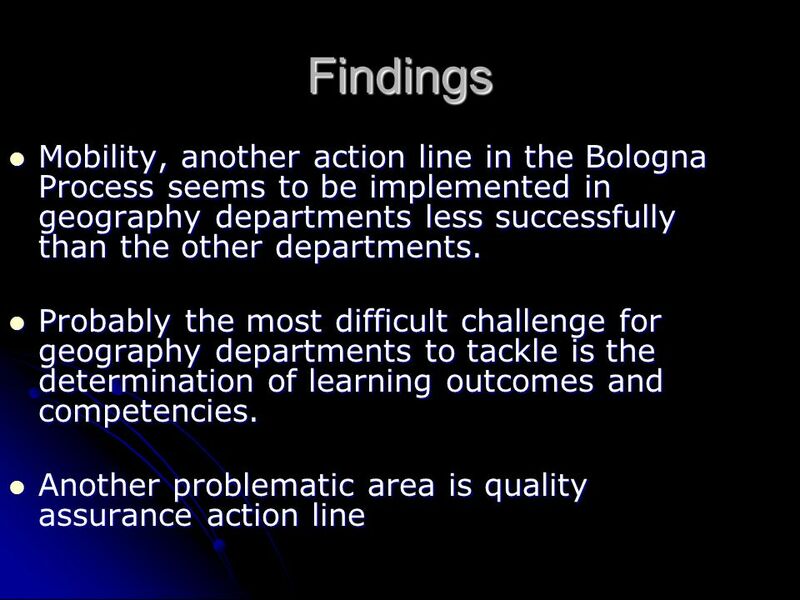 It is thought that the Bologna Process is an opportunity for geography departments to modernise themselves. Compared to other disciplines a number of publications stressed that academic geography in Turkey rather weak and there is a strong need to modernize the departments. It is thought that the Bologna Process is an opportunity for geography departments to modernise themselves. 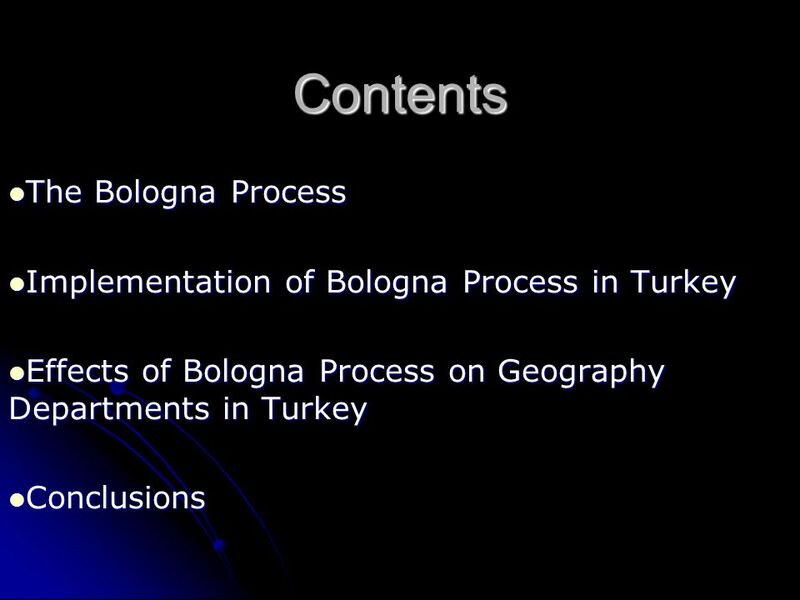 Download ppt "EFFECTS OF BOLOGNA PROCESS ON GEOGRAPHY DEPARTMENTS IN TURKISH UNIVERSITIES Dr. Yilmaz Ari Department of Geography, Balikesir University, Turkey. Future." =. T HE M AIN C HALLENGES AND P OSSIBILITIES OF M ATCHING THE H IGHER E DUCATION S ECTOR WITH THE L ABOR M ARKET Aleksandr Hakobyan, AIPRG, YSU and TEMPUS. Robin van IJperen European Commission 10 June 2010, Graz The challenges of joint programmes: haute cuisine or (con)fusion? The view of the European Commission. 1 Bologna Shaping the Agenda Bologna today and tomorrow Lesley Wilson Secretary-General, European University Association. European Responses to Globalisation in Higher Education C onvergence and Diversity European Responses to Globalisation in Higher Education C onvergence. Attractiveness of the HEIs in the EHEA An Introduction to WG 3 Pavel Zgaga University of Ljubljana Bologna Conference Fostering student mobility: next. The Bologna Process and the Scottish Credit and Qualifications Framework Dr Gillian Mackintosh Head of Registry. HERODOT International Conference: Torun, Poland 2-5 September Tuning and European Higher Education Geography Kevin Crawford & Karl Donert Liverpool. Osnabrück Prof. dr. Antoon Ven, PhD, MSc PT, MSc MT. The Modernisation of Higher Education Introduction Anthony Vickers 27 th June 2012. 1 Bologna Process Seminar Friday 12 May The Mobility Challenge Sorbonne Declaration, May 1998 “At both undergraduate and graduate level, students. Quality and the Bologna Process Andrée Sursock Deputy Secretary General European University Association (EUA) EPC Annual Congress, March 2005, Brighton. How quality and competitiveness of European universities are reflected in global academic rankings a Bologna perspective on competitiveness: it can help. The European Higher Education Area A dream worth having! Dr Anthony Vickers, FIEE, MInstP, CEng, CPhys UK Bologna Expert. 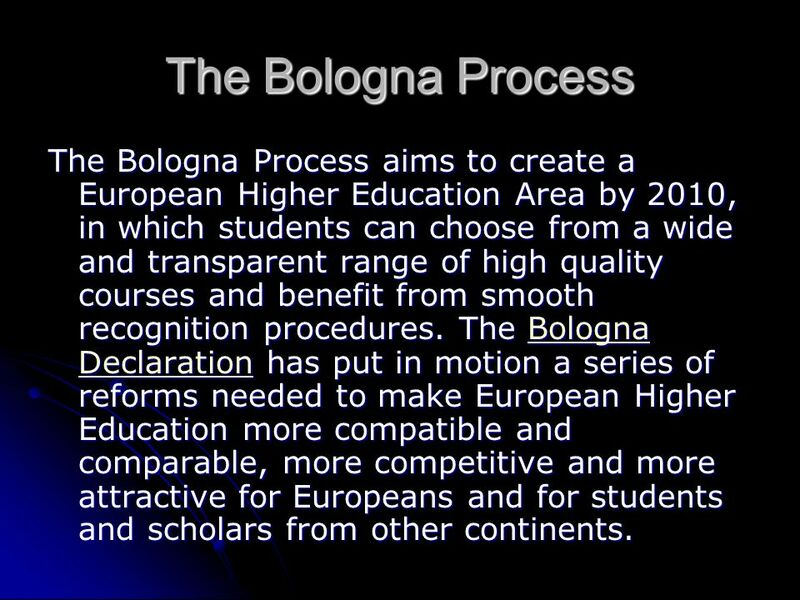 The Bologna Process and the European Higher Education Area Ensuring Worldwide Competitiveness of Master’s and PhD Programmes at European Universities of.